Debut of choral piece helps mark National Day of Remembrance and Action on Violence Against Women. In a solemn ceremony on Thursday, the Queen’s community remembered the 14 women killed at Montreal’s l’École Polytechnique on Dec. 6 1989. 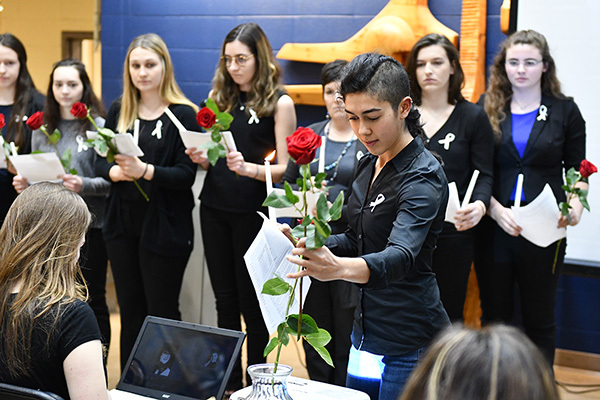 During the annual event, organized and hosted by the Engineering Society of Queen’s University, 13 female engineering students and one staff member held red roses, lit white candles, and read a brief outline of each of the victims. A new addition to the ceremony was the EngChoir’s debut performance of the choral piece Chrysalides, co-written by fourth-year engineering student and EngChoir Director Monet Slinowsky. Read this Gazette article for more about the creation of the piece. The event was attended by dozens of Queen’s community members, including students, faculty, staff, and administration members. Twelve female engineering students, a nurse, and a faculty member were killed in the 1989 massacre. Three years after the attack, Dec. 6 was declared the National Day of Remembrance and Action on Violence Against Women.